Princess Polish: Happy St. Patrick's Day! 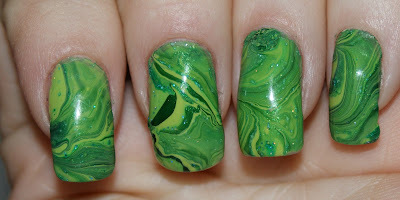 This water marble was done with Zoya Holly, Sally Hansen Green with Envy, and Funky Fingers Blitzen (hence the glitter). I wanted the effect to look like waves, as if green liquid was being poured into a glass. Mainly because I'll be working so no beer for me. Haha. While I'm celebrating with a water marble mani and a ton of Sprite Zero with green food coloring, I hope you're all being careful out there! Drink responsibly and trust your instincts. And be sure to check in and let me know you survived St. Patrick's Day 2012. After all, there is a brand new Zoya Collection to look forward to and you wouldn't want to miss that! Well, this Irish heritage girl will probably only having a glass of wine with dinner so you know I'll be surviving this day. Nice mani, I love how the Blitzen really adds to it.